Boston isnt only the cradle of independence but, its possible to argue with some justification, the hub of independents. For a quarter of a century, the Boston area has been a proud center for pioneering documentaries, from Frederick Wiseman and Eyes on the Prize to Errol Morris, and, if less frequently, for merrily-made non-Hollywood features, from Jan Egleson to Brad Anderson and Robert Patton-Spruill. Boston films? Brainy, socially aware, race- and class-conscious, comfortably low-tech (this is a 16mm capital). But what about the rest of Massachusetts? And out there, in the Northern New England states? We are fortunate that the New England Film and Video Festival, sponsored by the Boston Film/Video Festival, offers an annual opportunity for regional catch-up. Each spring, theres a brilliant chance to discover films from outside our fair city, to grasp anew that formidable film work marches on about New England. The important ouevres of Walter Ungerer and Jay Craven in Vermont, Michael Corrente in Rhode Island, are only a beginning. Its clear to me that not living about Boston has proved often, for independent filmmakers, a decision with enormous aesthetic consequences. Freethinking New Englanders often seem even freer making cinema in places far from Harvard and Cambridge and WGBH. The films produced are even less attuned than Boston ones to the vicissitudes of the marketplace. They are more happily microcosmic: local. Next Stop Wonderland was regarded as "a Miramax flop" in much of America, but Bostonians were taken by Brad Andersons gentle comedy, delighted for a movie which actually reveled in its contemporary Boston settings, situating its characters time and again in recognizable local environs. Being so "in touch" is irregular for a Boston work. Its very normal for most non-Boston regional filmmakers who, away from New Englands busiest city, seem to notice things up close. The works are ecological, ambient; they are celebrations of mountains and forests and rivers and backroads and changing seasons, but also, interestingly, of urban life. Among past award-winners of the New England Film and Video Festival, whats an obvious example? 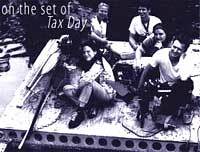 Laura Colellas wondrous 1999 feature, Tax Day, which takes the filmmakers Providence, Rhode Island, through the looking glass and into a gentle surrealist realm, where it glistens and glows like an MGM emerald city. Colellas premise is so startlingly simple and so amazingly effective: two fortyish women, Irene (Kathleen Monteleone) and Paula (Donna Sorbella), spend a whole long, ripe, seemingly endless day in doing nothing, nothing at all, but strolling about through the Providence streets, or climbing on busses to wherever, or canoing down an idyllic river, or being beckoned into an apartment house, or listening to rock music in a town square, or eavesdropping on random conversations and yard sales, or conversing with odd strangers. Magical! Their balloon-and-ice cream day is the one we frenzied workaholics cant bother to have, when wed dare SLOW DOWN. Theres a carnival around us, a multicolored street fair, in the corner of our vision. If only we paid heed! Colella makes this soul-life palpable. And in the most appealingly European way. The cinema of Raul Ruiz swims through the film, and obviously Jacques Rivette; and the early early Providence morning opening is, I believe, an homage to the Parisian wee dawn of Jean-Pierre Melvilles Bob le Flambeur. The riveting 1998 feature, Anima, made by Craig Richardson, who lives in Jamestown. Its special quality is the determined, almost non-Western slowness, Richardsons dogged refusal to hurry his narrative along. What choice does he leave his audience? They must alter their expectations from plot revelations (although there are some stunning twists) to philosophical rumination. Anima is a kind of parable, this unusual tale of an older couple living a shrouded symbiotic life, guarding a secret from Germany during the War. But its not precisely the cliched secret: the revelation of a Nazi past. Everything here is subtle, somnolent. And the setting--a quiet farmhouse in the off-the-path New England countryside--mirrors the hushed tale. Its interesting to me how Richardson, shooting in rural Rhode Island, has caught something so special about the resonances of World War II to move even the most learned Nazi-hunting journalist/critic: Ron Rosenbaum, author of the monumental Explaining Hitler, headed a jury which named Anima the Best American Film of the 1998 Newport Film Festival. Rosenbaum described Anima in The New York Observer: "Utterly original...powerful feature." And heres another worthy filmmaker, a Festival Winner, whose work, made four hours North of Boston, too few know about: Dorothy Tod, a resident of Warren, Vermont. Since, the 1970s, everyone in charge (including its perpetrators) wants to "move ahead" on that long-ago War in Vietnam. In 1982, Tod did her most valiant to combat the national amnesia with the hard-hitting documentary, Warriors Women, a harsh visit with five Montpelier-area wives of American soldier returnees. Vermont might be a tranquil spot, but not for these beleagured women, forced to deal with their husbands post-War problems: drinking, depression, hitting the children, unemployment. Tod found just the right compassionate, non-didactic tone, which explains why the film was embraced by both anti-War factions and veterans groups. As with many activist filmmakers, Tods work has taken a personal turn in the 1990s. Far from Boston, she has been willing to bide her time, allowing years for a documentary story to play out its course. Her new 53-minute work, A Dyslexic Family Diary, is a rewarding, emotional look at a decade in the life of her son, Ben, a smart, happy, likable middle-class boy. Because of frustrations reading and writing, he lost confidence and started to loathe himself Eventually, Ben was diagnosed as dyslexic and sent to a special school. Also from Vermont: Ted Lyman, who lives in Richmond, and whose superb experimental films have been repeated winners of the New England Film and Video Festival. Lymans years of experience producing commercials and industrials render him at ease with the technical apparatus of movie making. He can shoot as nicely, or as roughly, as he so chooses, manipulate images, meld in stop-action or pixilation or xerox animation. His early films, Skycap (1974) and Alleydog (1974), are tour de forces of quick-edit, wide-angle imagery from nature, but Lymans work becomes genuinely masterful as it becomes conceptual, contemplative, and as the images are dwelled upon until their meaning (abstract) bubbles through. Scotland with No Clothes (1978) is a 10-minute Michael Snow-like filmic exercise, one mesmerizing take via a 16mm handheld camera of a waterfall. On the soundtrack: the spillage of water, which gets louder and LOUDER as the camera zooms in. Mansacts (1979) offers, in eight perfect minutes, three ways of looking at trees in the forest: (a)as matching-action, conventionally cut narrative, with a guy with an axe marching through the woods to a tree and cutting it down (b) as ethnographic documentary with voice-over, in real time and one master shot, a man pushing over a tree (c)as experiment, trees shifting about abstractly via stop-motion. Fla.Me. (1982).Water, water everywhere, from Maine to Florida: the cinema of Ted Lyman. Waves rising and crashing; a man coming out of the ocean, an atavistic memory of the ascendance of life. Mortals fearsome of vanishing at sea, where a storm can erase a man-made pier thats been up for a half-century. Canoers lost on a river at night, the shore an entanglement of impenetrable flowers. But the waters, however dangerous, are enticingly beautiful blue also: zen moments here of animated-pixilated divers dipping below the liquid surface. Years went by after the mid-1970s Fla. Me.shooting, and only celluloid images remained. Was it all (shades of Calderon) a watery dream? A fiction? Well, what do witnesses say? Its an extraordinary moment, when Lymans 7-year-old daughter, Jenny, confides that shes already suffering memory loss. "Im not sure if it was the picture, or when I was actually there," she says. Its all a blur from when she was 4 years old. Testament of the Rabbit(1989). The filmmaker on a train trip, and thoughts of his boy and girl dissolve into romantic, color images of them playing funny games in an autumnal pastoral setting. The train chugs along, until its train-on-the-track clanging noises become a mantra loop on the soundtrack. On screen, an abstract, photographically degenerated image spins round and round, and subtly morphs into the pixilated filmmaker himself leaping toward the camera like a bearded jack-in-the-box, like an impish devil. Theres minutes upon minutes of this, a whirling dervish conclusion to a dazzling film. First Surface (1996). Lyman mucks around with the relation of form and content by having his experimental movie look, unexpectedly, like a flat, brightly colored Saturday morning kiddie show in a Peewees Playhouse kind of set. Theres a narrative about an unhappy boy who (TV again) changes and "learns." So far, everything is banal and simplistic: but what unfolds in perhaps Lymans most complex film, concerning this forlorn boy (his real-life son) who is cursed by thinking backwards and forwards in time, his brain a Kurt Vonnegut novel unstuck in space. Two images are repeated and repeated: one of the Lyman family of four in a row, the other of a crashing waterfall. The boy is disturbed by them, haunted by them, and puzzled about how they are linked. Ted Lyman is likewise obsessed, because all of his tremendous films appear to be unconscious carriers of the ancient dilemma of Odysseus: the pull of water (adventure, the dangers of Poseidon), the lure of family (domesticity, safety). Abraham Ravett, who teaches at Hampshire College, lives in Florence, Massachusetts. Alone among the filmmakers I am discussing, Ravetts work seems to look completely beyond the tranquil, rural place he resides. He is the adult child of very bruised Holocaust survivors, and his brilliant experimental family dramas--incorporating family photographs, Nazi-taken archival footage, cell animation sequences-- are frenzied and driven, obsessed to recontruct what really happened to his mother and father when, as Jews unfortunately living in Poland, Hitler marched in. When Ravett filmed them, his parents were aging and mostly tightlipped. His father, soon deceased, is especially hidden about his time in the Lodz ghetto and, afterward, at Auschwitz. In the 1989 Everythings For You, he is a corroded, bitter man, who smirks because his son, the filmmaker, has a Christian girlfriend. Why does father care so much? Its almost an aside, when pop reveals how his own mother had hidden in an oven and a non-Jewish Pole had betrayed her to the Nazis, who quickly killed her. Amazingly, Ravetts mother hadnt lost an iota of her humanity, though a daughter by an earlier marriage was whisked away by the Nazis at Auschwitz (the 22-minute 1985 film, Half-Sister). Its a rare and tender moment when grandma hold in her arms Ravetts daughter. But Ravett wont let go of the horror that happened: his newest work is the magnificent 1999 The March, a compendium of interviews with his lovely mom about the notorious forced march of Jewish prisoners at the shutting down of Auschwitz. In each Q&A, several years have passed, as she reiterates her terrible story. (If it changes a bit with each telling, only the most demented post-modernist would argue that it is not objectively "true" at its core.) By the last interview, she is dying in a hospital bed, and less interested in reliving Nazi horrors than in telling her filmmaker son to "be a mensch." Ravetts harrowing family movies--bad things happen to good Jews-- need to be seen as a piece. They are grim, unforgettable counterpoints to the polyanna transcendant lies of Life is Beautiful. They are a celluloid complement to Art Spiegelmans Maus; and Jewish film festivals would be wise to consider a retrospective of this deeply important work. Can Abraham Ravett move his concerns beyond his own family tragedy? Well, theres the splendid feature-length documentary, Forgotten Tenor (1994), concerning Wardell Gray, the sweet-sounding saxman for the Basie band, who was murdered in May 1955 after a failed drug deal. Ravetts film takes its time at more than two hours, and it is nothing if not patiently idiosyncratic. Ravett repeats on three or more occasions the only footage, from 195l, that exists of Gray: a delicious solo on "I Cried for You," with Count Basie smiling approvingly at the keyboards. Another extended sequence: the frame is blank of images while, on his soundtrack, Ravett offers a long jazz tune with dueling saxophones. Only at the end are we informed that its Gray and Charlie "Bird" Parker, who are jamming in 1951 at a club in Framingham! There are telling interviews with surviving musicians (Art Farmer, Clark Terry, etc.) who knew, and played with, Gray, but Ravett not so much deconstructs the invisible "talking heads" form as shows how the magic is done. We are privy on his soundtrack to the conversations which occur prior to the on-camera monologues, the negotiations between filmmaker and camera subject about what will be discussed. In one revelatory moment, we listen in on a talk between Ravett and Grays ex-wife, in which she holds her interviewer hostage while they bargain about how much she should be paid for being on camera! Ultimately, how different in kind is Forgotten Tenor from Abraham Ravetts documentaries of the Holocaust? There is, I believe, a Kaddish over all the potent, elegaic stories: of Ravetts family among millions of innocent Jews destroyed by Nazis, of the tragic cutting down of one African-American musician who, they say, was the historic link between Lester "Prez" Young and Bird. Gerald Peary is a Professor of Communications at Suffolk University, ex-Acting Curator of the Harvard Film Archive, and a weekly film columnist for the Boston Phoenix.